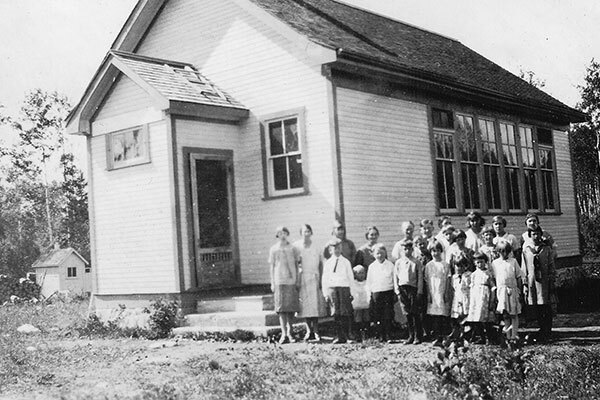 The Broadlands School District was formed officially in November 1918 and a three-acre, 242-foot by 540-foot parcel of land in the southeast corner of SE7-18-11E, in what is now the Rural Municipality of Alexander, was donated by Mr. Ev. Sandberg for construction of a one-room schoolhouse by Mr. L. Bjorkman. When the district was dissolved in 1968, its catchment area became part of the Agassiz School Division. Among the teachers of Broadlands School were Louis Hobbs (1922), Peter Brown (1924), Mr. J. S. Douglas (1924), Miss Annie Drawson (1924-1925), Ronald V. Shearer (1925), Mrs. Mildred Delahunt Bell (1948), Mrs. Beatrice Anna Chikowski (1950), Mrs. Jean Mary Marcenuk (1951), and Mrs. Anne Keith (1952). GR8461, A0233, C131-3, page 65. School Trustee Files [Broadlands School District No. 1945], GR1629, H-14-1-7, Archives of Manitoba. School District Formation Files [Broadlands School District No. 1945], GR1688, E0027, Archives of Manitoba.